Thanks to Barbara – a kindred spirit! I need to thank the wonderful Barbara Gruener for her insightful review of The Giant King that she posted on Fourth and Ten Blog. How we measure – let us count the ways! As the new school year rolls around again, my thoughts are turning toward our culture’s obsession with measuring. 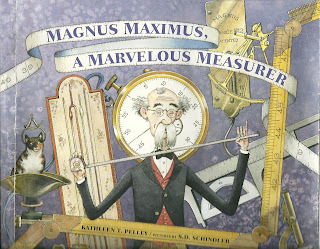 My book, Magnus Maximus a Marvelous Measurer was, in part, inspired by my experience of coming to live in America. Often people will ask me if I have a favorite quote to turn to when the rejection blues get to me, and I suppose if I had to pick only one, it would be this – a little magnet that I keep in my kitchen.